On Monday morning, I was picked up at 9:30am again for another tour with Viator. We started the morning visiting a local market in Villa El Salvador, a district of Lima that is considered to be one of the city’s shanty towns. The tour guide and I picked up some breakfast food, as we were invited by a local community leader to have breakfast at her home. Once we purchased bread, meat, cheese, and palta (avocado), we made our way further into Villa El Salvador, specifically to Bello Horizonte. Our host had a warm, delicious quinoa drink prepared for us upon our arrival, and we spent the morning discussing local “scary” stories or childhood fables, as well as difficulties that this individual faces when advocating for members of her community and ways to improve her community as a whole. Viator provides Villa El Salvador with funding that helps support community projects, in addition to completing community service within the town, as well as other towns without sufficient resources. We walked around the district and continued talking about some of the dire needs that the community faces. In some of the pictures below, you will notice yellow stairs that lead to most of the houses within the town. Years ago, locals had to walk up sharp rocks (that often ended up cutting through their shoes) in order to get to their houses, as their were no stairs or set paths. Many women fell on their way up the rocks, and sadly enough, many of these women were pregnant and ended up losing their babies. When a local political candidate stopped by the town a few years ago, he asked what the locals needed most. They responded by saying a better way to get to their homes. Once elected, the official made sure that stairs (known as the famous “yellow stairs”) were provided throughout the town. While the situation has improved significantly from what it once was, there are still areas in the town without stairs, leaving many locals continuing to walk up dangerous, sharp rocks. The town continues to have needs that are not being met, especially ever since the devastating huayco ( mflood) hit Peru in March, which has left many other cities in need of government resources as well. After the tour concluded, I stopped by Parque Kennedy in Miraflores, a beautiful park named in honor of President John F. Kennedy. From there, I walked over to El Mercado Indios, a local artisan market. Keeping in mind my flight tonight was scheduled to leave at midnight, I had plenty of time to make my way through the city. Following El Mercado Indios, I took a tour of Huaca Pucllana—impressive ancient ruins from the Wari culture, which was built around 500 A.D.
After the tour, I returned to Barrancos to take in the artistic sites, and then returned to my hotel, where I enjoyed dinner before finally making my way over to the airport for my (delayed) flight. Touring the different districts of Lima these past few days was truly enjoyable, especially since each district offers something unique and exciting. However, regardless of where you go, the locals continue to remain humble, kind, warm, and extremely welcoming, which is always incredible to experience. As I get ready to make my way to the airport now (even though by the time I publish this, it will likely be a few days from now), my experience in Peru is one that I will definitely cherish for years to come. But over the next few days, I’ll be sure to write about my “closing remarks” and highlights of the trip. So for now, it’s not goodbye. It’s more of I need to make my flight, so I’ll pick back up with where I left off tomorrow. On Sunday morning, I booked another tour through Viator, which focused on learning more about Peruvian cuisine. We stopped at a different local market, and learned more about the vibrant, delicious fruits and vegetables native to the different parts of Peru—la costa (the coast), la selva (the rainforest), y la sierra (the highlands). One specific fun fact (that I actually remember) is that Peru is known to have a wide variety of potatoes—more than 3,800 to be exact, and more than 55 types of corn. Incredible, right? Once we learned a little more about foods native to Peru, a local chef met up with us in the market. We had the opportunity to choose a menu that we would be cooking for lunch, and decided on ceviche as our entrada and lomo saltado for our main meal. Ceviche is made of small size pieces of fish marinated raw in fresh aromatic lime juice, tender onions, and boiled sweet potatoes, mixed with or without Andean hot chilis. Lomo saltado on the other hand is beef tenderloin slices, sauteed with onions, tomatoes, aji (hot peppers), and more spices. It is served with French fries and rice. Once we had all of the ingredients chosen, we drove over to a local outdoor kitchen, where we began our cooking course. We started with cutting up vegetables and preparing the fish for our ceviche. We took a quick break to enjoy chicha morada, a refreshing drink (made from purple corn), as well as cancha (toasted corn nuts) and chifles (fried platanos) with ají. We then sampled local fruits, native to Peru including lucuma, granadilla, tuna (two types—green and purple), aguaymanto, and pepino dulce. Once we finished snacking, we got back to work and completed our ceviche. While it may take hours or an overnight process to cook fish in lemon or lime juice anywhere else, the lime juice in Peru is so strong and acidic that it only takes three minutes mixing the juice with the fish in order for the outside of the fish to cook. Since ceviche can often be spicy, sweet potatoes are usually added in order for there to be a sweet taste included in the dish as well. Once we enjoyed our ceviche, we got back to work once again and completed our lomo saltado. Learning more about such reputable Peruvian cuisine was a great experience, and being able to taste the results was just as enjoyable. This morning (Saturday), I booked a tour through Viator called Lima Colors and Flavors. The tour guide picked me up from my hotel at 9:30am, and once we picked up the other tourists, we drove to the district of Chorrillos, which is a local town that prides themselves on fishing. Here, the fishermen can be found fishing at 4:00am, 11:00am, and between 2:00-3:00pm. Their wives can often be found tending their stands in the fish market. Based on the times that the fishermen are out fishing, it is recommended to eat ceviche in the early afternoon and not for dinner, since the fish is freshest earlier on in the daytime. 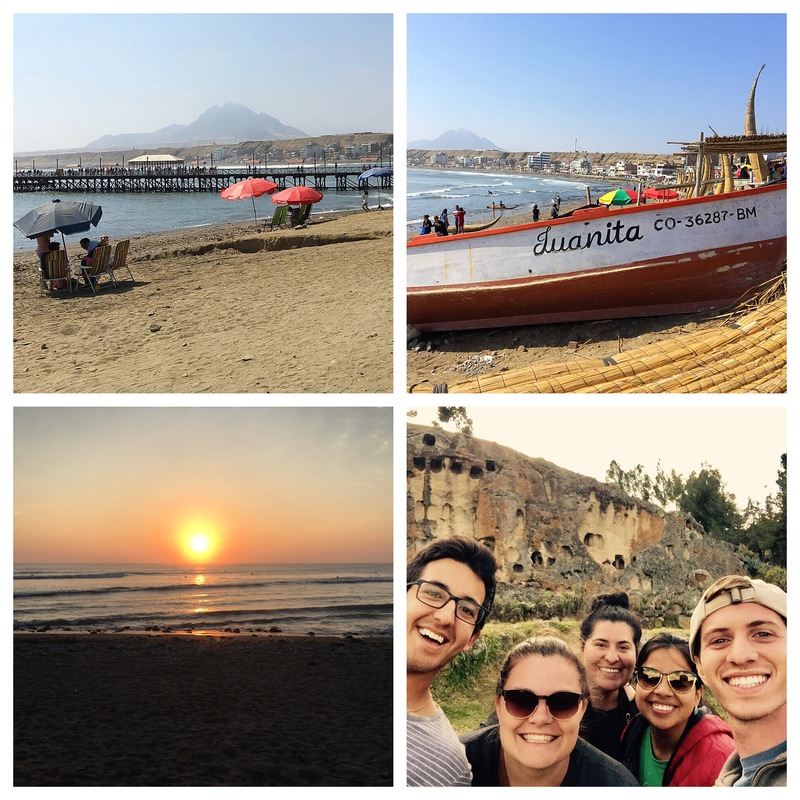 Once we finished walking around the fish market and the port, we continued our tour in the Chorrillos neighborhood, and walked around the local markets. We sampled a wide variety of fruits native to Peru including lucuma, granadilla, tuna, aguaymanto, chirimoya, pepino dulce, pitahaya, tumbó, and platano de isla. The colors of the fruits were vibrant, and the fresh taste of each one was absolutely delicious. Following our walk around the local markets, we stopped for lunch in a cevichería, where we ordered chicha morada to drink (made from purple corn, cinnamon, cloves, a little sugar, and pineapple), and triples which included arroz chaufa, chicharron de pescado, y ceviche. The food was great, and it was just what we needed to continue our walking tour. After lunch, we drove to the district of Barranco, and saw the Bajada de los Baños (a pathway to the ocean), as well as the romantic Bridge of Sighs, which is known to be a romantic site. It is also said that if you walk across the bridge while holding your breath, you are entitled to a wish. As we walked around the district, we came across beautiful art painted by talented local painters. In 2015, Barranco organized a competition named “Las Paredes Hablan” (The Walls Speak). About one hundred people entered the competition, and the ten finalists were each given public wall space to paint their artwork. Some of the incredible art work can be seen pictured below. As nighttime approached, I stopped by Larcomar, an impressive outdoor shopping center located by the ocean in The district of Miraflores. There is a free art museum that features paintings and photography from local Peruvian artists, so I made sure to check that out, before enjoying dinner (ají de gallina) and walking around the center.